Beautiful modern and tastefully decorated home right on the river. Enjoy kayaking, swimming or simply relaxing as you watch the world go by right from the backyard. At night you can count the stars and watch the fireflies. Stroll to the hip town of Narrowsburg or take a bike ride and discover PA across the bridge. Great restaurants, shopping and outdoor life awaits you. A native NYC girl with a passion for real estate. Environments are very important to me and I strive to make everyone feel as comfortable and relaxed as I am in my homes. I love to travel and when I do being comfortable is very important to me. Hosting allows me the opportunity to share my love of all things beautiful. Whether it's a comfortable bed, clean white sheets or an amazing view, you should always make your guests feel at home. I love this property for the peaceful vibe and amazing river view. A perfect escape from the city to chill out. Whether your active or need a hideout - this place is for you. Walk or bike to town - enjoy the great restaurants and local shops in town. Take a day trip to nearby Callicoon or Livingston Manor. Go kayaking down the river, hiking in the mountains or lay in the hammock and read a great book. Great entertaining space to bbq with good friends. Walk to town or go swimming in the river in your own backyard. You'll love the house and all it is has to offer. Property manager right across the street. 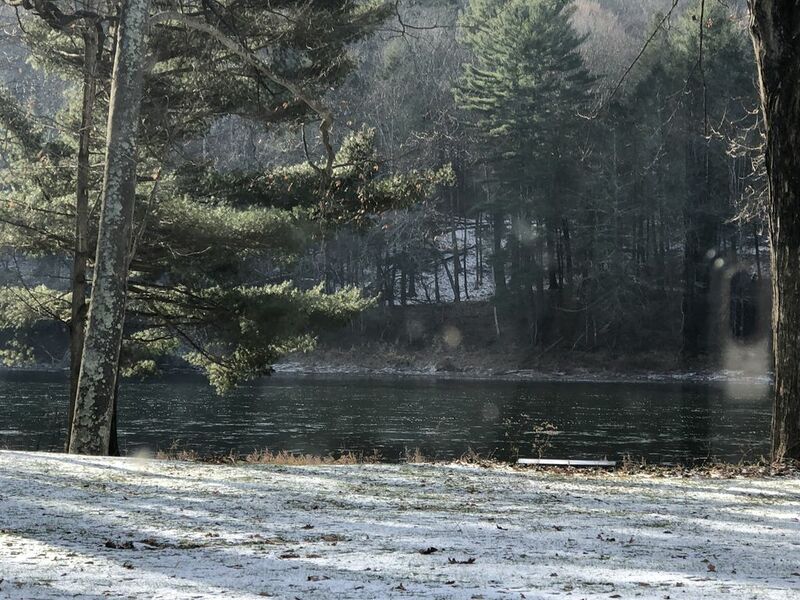 View more about Allison N.
Watch the river from the backyard or living room. Beautiful and peaceful setting. The house is amazing! It is new and modern with fantastic view on the river. Very beautiful place! The backyard right on the river is super convenient for fishing and outdoor recreation. We will definitely go back in summer time! Also , we got helped immediately by owner and house manager with anything we needed. Very appreciated! Hi Evgeniya, Thank you so much and am so happy you enjoyed your stay. Your family were great guests and we welcome you back anytime. Beautiful location on the Delaware! Allison's home is a tranquil, clean lined, modern oasis on the front of the hypnotic, flowing, Delaware River. The house pays careful attention to detail, well equipped, newly upgraded systems and appliances, super clean and the view! The peace and quiet allows one to listen to the hum of the flowing Delaware River in the back yard. I highly recommended staying here. Wonderful home. Comfortable. Incredible view. Thanks for a tranquil few days! While watching the gorgeous Delaware River from the back of Allison's lovely, well-appointed home. The impressive, thoughtfully laid-out house (surprisingly spacious), has every modern convenience but without being overdone and fussy. Beds were supremely comfortable, maybe the best we've ever slept on outside a luxury hotel. If you want non-stop engagement with nature very close to a super-cute budding farmer town that has delicious food, spirits, and locally made crafts, Allison's house is your place. Thank you so much for this review. I’m so thrilled that you (and all my guests) were happy, comfortable and relaxed. That’s the best part of hosting. I welcome you back anytime. Very nice, clean house in quiet neighborhood. Enough room for 5 people. Perfect family vacation! My family enjoyed the house, felt like home. Alison is very helpful, easy to work with. Complementary bottle of wine was a great touch. Thank you! Kitchen has all you might need for cooking! It was very nice to meet Janine and she was very welcoming and ready to help if you have questions. Beds are very comfortable and clean. Great fishing in Delaware river. Will definitely recommend this place and will rent again. Thank you Nataliya so much - we loved having you as guests and so glad you and your family enjoyed yourselves. We welcome you back anytime!